First Round : Ben Crenshaw and Lanny Wadkins shot five-under par 67s and led by two over Andy Bean, Jim Nelford and Gary Koch. Second Round : Bean moved two strokes in front with his eight-under par 136. Crenshaw was at 138. Third Round : David Graham now was in the lead at eight-under par 208. Bean and Scott Hoch tied at 210. Weather: Thursday-cool and breezy. Friday-clear. Saturday-mostly cloudy with a few light showers. Sunday-thunderstorms, play suspended at 9:30 a.m. and resumed at 11:10 a.m. Play suspended again at 2:47 p.m. and resumed at 4:45 for a total of 3 hours 38 minutes. "Poetic justice," someone decided. 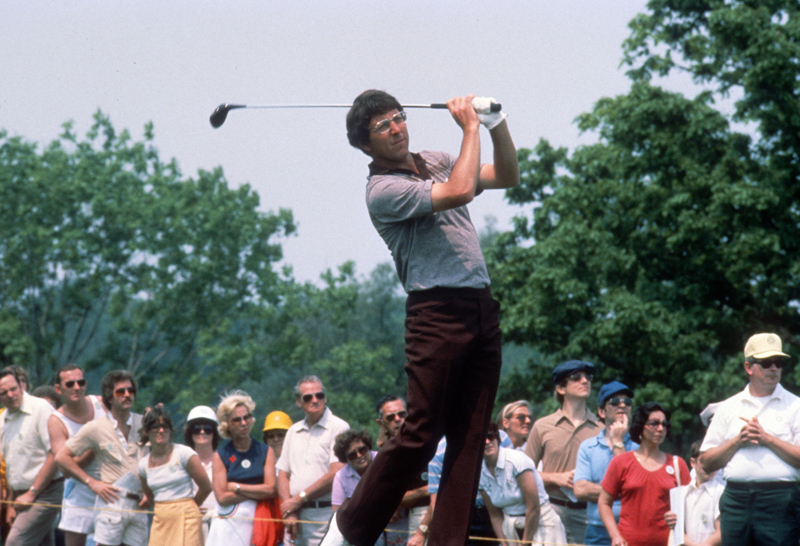 In 1976, the first Memorial Tournament, Hale Irwin lost a four hole payoff to Roger Maltbie, who averted possible elimination with a now-famous "carom shot" off a gallery rope stake on the third overtime hole. Now, seven years later, the 37-year-old Irwin had survived another taxing finish to capture the title. "Ever since the (1976) loss, I've wanted to win this tournament," he said afterward. But, as he waited in the scorer's tent while Ben Crenshaw and David Graham attempted to match his 281 total - and failed by a stroke, he insisted he hadn't allowed any reruns of ancient history. "If you conjure up thoughts of so long ago, that become a negative influence," he noted," and I didn't want that." But he did confess "I was thinking playoff." Or maybe that should be HOPING playoff. As Irwin holed out on No. 18 (69 final round) for his 7-under-par Crenshaw was embarking on No. 17 at 7-under. Crenshaw missed the green and two putted for bogey to drop to 6-under. Needing birdie to tie he hit a fine shot to No. 18 to within 18 feet, but his potential tying putt slipped by and one Irwin challenger disappeared. Meanwhile, on No. 16, Graham had overshot the green and into deep grass above right, with a bunker intervening. After using 5-and 6-irons on the 204-yard hole in previous rounds, Graham ruefully recounted "for some reason, I got up there today and pulled out a 4-iron and hit it 15 yards too far." Arriving at his ball, he decided "I had no shot," slashed it into the trap, exploded out 18 feet strong and two-putted for double bogey and 6-under. He parred No. 17 and like Crenshaw, needed birdie on the unyielding No. 18 -and again like Crenshaw, missed a tying putt from 25 feet. Irwin was relieved and surprised. "It would have been naive to think that David would double-bogey and Ben would bogey to allow the events that happened to happen," he suggested. "You never wish a guy to make double bogey, but that was very nice of David to do that." That he got a little help from his friends did not detract from Irwin's achievement. He EARNED the title: being the first player in eight Memorials to play all four rounds under par (71-71-70-69): coming within one of Graham's tournament record 280 total; and finishing with a 3-under-par 69 to 71 for Crenshaw and 74 for Graham. Irwin entered the final round 4-under-par, four back of Graham and in a six-way tie for sixth place. He made birdie putts of 15 and 18 feet on Nos. 7 and 8 to move within a stroke of Graham and one ahead of Crenshaw. "I was feeling good," he said later, "because I was playing very well and they were falling back. That's when I felt like I had a chance to win. As Irwin stood on No. 12 tee, the sirens blew, signalling what would be the day's second long rain delay. "After that, I never had the same feeling" he con-tended. "I felt like I was hanging on the last seven holes." The former U.S Open champion did a pretty good job of holding on. Crenshaw had tied Graham with a birdie at No. 12 and Irwin joined them at 7 under on the treacherous No. 14, wafting a 5 iron to within five feet and sinking it for birdie. Crenshaw fell back with a bogey at No. 14 and up ahead, Irwin was finishing out a bogey on No. 15. Graham drilled a 10-footer on No.14 for birdie and a two stroke lead - and looked like he might be the first two-time Memorial champion. Irwin heated up the hectic stretch struggle with a 25-foot chip-in from the fringe at No. 16, reducing Graham's edge to a single stroke. "It went in like a putt," Hale reported. Crenshaw matched the deuce on No. 16 moments later to also edge within one. And so the stage was set for the dramatic finish. Considering what happened to Graham, No. 16 accounted for a three-stroke swing. Actually more than that, because David had a bogey there in the third round. Assessing his 15th PGA TOUR title, worth $72,000, Irwin, who is acknowledged as one of the most consistent of pros, said, "We (TOUR pros) all very much point for the Memorial Tournament. If you don't then you're not appreciative of what a golf tournament should be. It has always been my desire to win it." Host Jack Nicklaus had predicted scores would be lower in 1983, because Muirfield's greens had been completely resurfaced (when disease hit the original greens) and were expected to be slower. He appeared to be right when Crenshaw and Lanny Wadkins carved their Muirfield best-evers, 67's to lead the first round. Andy Bean added a 67 in the second round, his Muirfield best ever. He had seven birdies in the first 11 holes to lead Crenshaw by 136-138. Graham, Wadkins and Peter Jacobsen were at 139 and Tom Watson projected himself into consideration with four birdies and an eagle in a 67 for 140. Graham revealed he had been suffering from a case of "pink eye,'' but his game wasn't noticeably affected. He connected on five birdie putts in the last six holes in a 69 that netted a two-stroke edge over Bean and Hoch, 208-210, in the third round. Bean roared to 10-under and a two shot lead after nine holes, but finished with a 74, including a seven-hole stretch of four birdies and three bogeys. Hoch tied the tournament record of five consecutive birdies, starting at No. 5. Jim Thorpe closed with a 70 for fourth place at 283. Tom Weiskopf provided the final-day fireworks with a tournament record 65, seven under the card - despite a bogey on No. 18. In tying the front nine record of 31, he birdied Nos. 2, 3, 4, 5 and 8, with the longest putt 15 feet. "It was pretty exciting," he attested. "I've never had nine birdies in a round before." Weiskopf finished at 288, two better than defending champion Ray Floyd, who apparently had lost the Muirfield combination. Watson also was among the 288's while Arnold Palmer authored the tournament's most spectacular turn-around: from a triple bogey on No. 2 in the first round to an eagle on No. 3. Host Nicklaus never figured, after a first round 76, but still maintained, "I'd rather win here than any tournament I play." The new Muirfield greens, replaced in July of 1982, were very fast early in the tournament, but slacked off slightly. But players universally agreed with Crenshaw that they were "remarkably good for being only 10 months old." The Memorial purse was boosted by $50,000 to $450,000-plus prior to tee-off.